The mathematical and computer simulation of social and economic systems is receiving more and more attention. The dedicated scientific community is rapidly growing and involves, besides sociologist and economists, also physicists, mathematicians, computers scientists, biologists, engineers, and the communities working on complex systems and operations research. To keep an overview, it is important to be well connected, and to benefit from shared information platforms. The division on "Physics of Socio-Economic Systems" (Φ·SOE, previously AKSOE/AGSOE) is committed to support the scientific exchange between the scientific disciplines involved. It has currently more than 300 members and organizes a spring conference with typically 70-100 contributions each year. During this conference, it features outstanding international speakers not only from socio- and econo-physics, but also from sociology and economics. Furthermore, scientists are awareded for outstanding innovative work in this field. Invited talks by Jan Lorenz (Bremen), Tiago Peixoto (Bath), Tiziana di Matteo (London), and t.b.a. Mark the date in your calendar - and book a hotel already in October if you want options (this is not a joke); we strongly recommend to contact the hotels directly (email/phone/fax/hotel website, not via usual portals). Suggestions for SYMPOSIA (topics with relevance to 3+ divisions; 5 international speakers), tutorials (1-2 divisions, 3 speakers) and / or plenary speakers should be made as soon as possible (latest 10 of June and very latest during the week thereafter). Especially symposia suggestions should be discussed as early as possible to receive support. Already now think ahead of your contributions (talks, poster(s)) and mark in your calendar to submit a few days ahead of, or latest by, 1. of December. If you need a formal letter of acceptance, please let us know. In the case a contribution can not be accepted the submitting author would be contacted within 2-3 weeks. If a contribution is accepted as poster only, we notify in early January. The conference system will send an automatic confirmation at a late stage (early February) when the contribution is finalized. Still want to contribute more? You can always suggest invited speakers, or organize a Focus Session or Joint Session at any time. Suggestions are especially welcome until July (possibly early August) such that the call for contribution can be displayed on the SOE poster. Previous conference: March 11-16, 2018 in the open-minded world metropole Berlin! Focus Session (DY/SOE/BP) Physics of Contagion Processes (org: Philipp Hövel, Pawel Romanczuk, and Jonathan Donges) - Contributions welcome! Yough Scientist Award 2018: Prize talk by Martin Rosvall - Congratulations! before 1st of December - and do not forget to (i) book your hotel and (ii) to register within January or before 5th of February to ensure you get the early bird fee! SOE increases! We had 116 abstracts (including a good fraction of posters)! Thanks for all who submitted! Anna Nagurney (U Massachusetts) "Design of sustainable supply chain networks for sustainable cities"
Hermann Held (Hamburg) "Dynamical effects of climate investment under uncertainty"
Salvador Pueyo (Barcelona) "Ecological econophysics for degrowth"
Tim Lenton (Exeter) "Physics concepts to anticipating and avoiding critical transitions"
There will be an accompanying session - please submit your contributions! Also posters are welcome for this topic. Duncan Watts (New York): "Computational Social Science: Exciting Progress and Future Challenges"
Luis Bettencourt (Santa Fe): "Cities, Scaling and Sustainability"
Sebastian Krause (Zagreb): "Spin models as microfoundation of macroscopic financial models"
Katarzyna Sznajd-Weron (Wroclaw) "Voter models and other dynamical spin models of social opinion formation "
The conference is community-driven! If you are interested in organizing a Focus Session, please get in touch! The YSA 2014 goes to Roger Guimera! Congratulations! <h4>Call contributions (talks, posters) and nominations for the Young Scientist Award (YSA)!</h4> Next DPG spring meeting, 30.March - 4.April 2014 in Dresden, is approaching!<br> Please send your suggestions for invited speakers / topical speakers by 1. of August to <span style="background:#ccf;" tal:replace="structure dpgemail: ">[replace]</span><br> <br> Suggestions for Focus Sessions (may be joint sessions with other divisions) are still possible (please contact us immediately).<br> <br> The deadline for contributed talks or posters is 1. of December.<br> <br> Nominations for the SKM dissertation prize (all condensed matter divisions) can also be made before 5. of December.<br> <br> The deadline for nominations for the YSA (Young Scientist Award for Socio- and Econophysics) also is 1. of December, <a href="https://www.dpg-physik.de/dpg/gliederung/fv/soe/YSA/preistraeger_YSA.html"> see the full announcement</a> - <a href="https://www.dpg-physik.de/dpg/gliederung/fv/soe/YSA/formular-call/call.html">please click here for the nomination form</a>. SOE Program of DPG 2014 Dresden is out! The Young Scientist Award 2013 for Socio- and Econophysics goes to Vittoria Colizza. Congratulations! The prize is awarded during the award session on Monday afternoon, 16:00 at lecture hall H37. Alan Kirman setting the stage with his invited talk "Mind the gap: What economics, social insects and statistical physics can learn from each other", followed by the prize presentation and the awardee's talk. The session is followed by a social get-together with beer, pretzels and Leberkäs. Current event: Spring meeting, Regensburg 10.-15. March 2013. Do not miss the exciting program! Registration is still possible, even on-site. Ian Couzin (Princeton, USA) "Distributed sensing and decision-making in animal and human collectives"
NEW! Thursday 15:00-15:45 Jörg Reichardt (Würzburg) "Spin models for the analysis of network data across the sciences"
Kim Sneppen (Copenhagen, Denmark) "Modeling co-existence of competing opinions"
Dirk Brockmann (Northwestern, USA) "Have we been looking at the spread of epidemics all wrong?" Alan Kirman (Marseille, France) "Mind the gap: What economics, social insects and statistical physics can learn from each other"
and as a special highlight: Plenary talk (Monday, noon): Sidney Redner (Boston, USA) "The dynamics of wealth, popularity and persuasion"
Change in program: Thursday 15:00-15:45 Jörg Reichardt (Würzburg) "Spin models for the analysis of network data across the sciences"
The program for this year's DPG Spring Meeting (Regensburg, March 11-15, 2013) is out! You can download the SOE portion here and the full conference program from the conference homepage. The "Young-Scientist Award for Socio- and Econophysics 2012" goes to Dr. Arne Traulsen, Max-Planck-Institute for Evolutionary Biology. 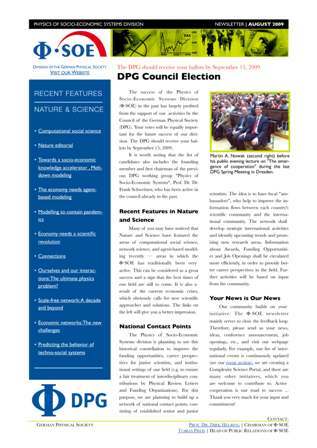 The award ceremony will take place during the DPG spring conference on March 28, 2012. See the conference program for details. Media coverage of the SOE program: "Das Klickgeheimnis des Erfolgs", "Börsencrash mit Ansage", and "Zehn rote Luftballons". Interview with Prof. Dr. Jürgen Mimkes: "Physik der menschlichen Gesellschaft - Formeln der Freiheit". 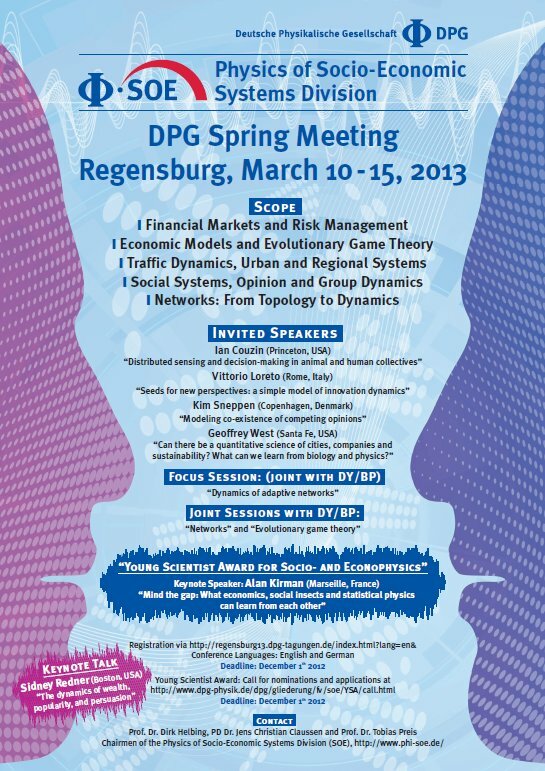 The program of the DPG conference in Dresden, March 13 to 18th 2011, was published at http://www.dpg-verhandlungen.de/2011/dresden/index_en.html. The program of our division can be found here (Graphical Schedule).